The Alpaca Expo Tracker is a comprehensive tool to transparently view project status at any time, from any location via a smartphone or tablet. We document every project with all relevant information from briefing, drawings, documents archive up to on-site pictures of the construction and the project review. You have all information always and everywhere at your fingertips. The Alpaca Expo Tracker helps you to keep an eye of your expo stand. Wherever you are. Our Expo Tracker automatically indicates where a deadline is about to end or to miss. Go with the flow and be involved and manage things when they need to get done. With our Alpaxa Expo Tracker you have all your documents, schemes and contracts at one place. See the whole progress of your stand and the major steps within the “build-up” view. Brief – Here you will find all relevant documents concerning the briefing for your project. No information is lost. Your wishes and requirements are accessible to everyone in our team working on your project. Design – Take a look at the current status of your design proposal. You can address your comments and change requests to us at any time. In this way, we can arrive at a final design proposal in the shortest possible time and you have full control. Documents – Under Documents you will find all relevant documents concerning the project. Requirements, hall plan, specifications, contract, everything at a glance and accessible from anywhere. This allows you to manage and overview several projects at the same time. Build Up – Our team provides you with pictures of the construction and documents the progress of the project. So you don’t have to be on site and can still follow, control and comment on all steps, which are directly implemented by our team on site. Review – A review of the project is important for us to ensure that our customers are fully satisfied and had a successful exhibition. Changes for upcoming exhibitions will be included in a review of the project and taken into account in the next project. If you want to learn more about the Alpaca Expo Tracker, please contact us for a live demo by our team. Request a guided tour now! You get a detailed overview of all your projects and the project progress. 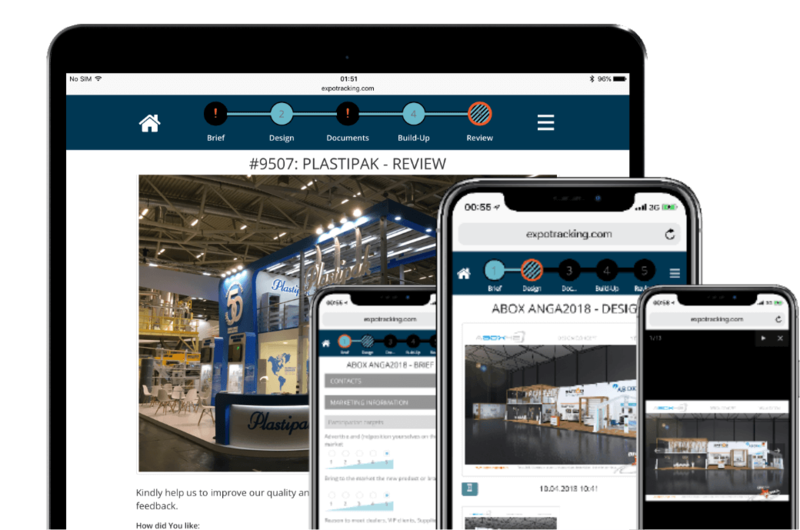 New design proposals, costing updates and fresh pictures from the construction site or build up will reach you immediately on tablet, smartphone or desktop wherever you are. You do not need any installation or special requirements to use the Alpaca Expo Tracker. Our tool works with any standard web browser. Frendly and easy to use interface helps you to quickly navigate through the project. The Alpaca Expo Tracker instantly shows you the status of your project and provides you with details and access to all important documents in no time at all. All approved documents are in one pocket. The Alpaca Expo Tracker can be used worldwide and is available free of charge. You will receive email notifications when there is a new status and using the unique direct link you can quickly get into the system. The Alpaca Expo can be used with any popular smartphone, tablet and PC. All you need is a web browser and your access data once to gain access.